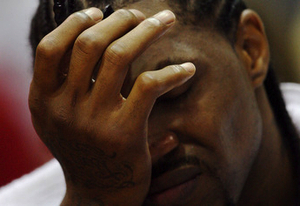 Udonis Haslem of the Miami Heat is not only facing felony marijuana charges — he could also lose his Mercedes. ​NBA star Udonis Haslem is looking at felony marijuana possession charges after a traffic stop in Florida Sunday afternoon during which the Miami Heat forward and a friend were arrested. The Florida Highway Patrol said Haslem, 30, was busted for felony possession of marijuana in excess of 20 grams, reports Ira Winderman of the South Florida Sun Sentinel. A passenger in the vehicle, Antwain Fleming, was also charged with misdemeanor possession of less than 20 grams of cannabis. Fleming acknowledged in the police report that luggage found in the car and containing the marijuana was his. ​Haslem’s black 2008 Mercedes sedan was impounded after the arrest, and on Monday the state of Florida filed notice that it will attempt to permanently seize the vehicle. Haslem also acknowledged possession of a firearm in the vehicle at the time of the stop. ​Haslem, 30, was arrested after a traffic stop that also resulted in the former University of Florida standout being written up for speeding and illegal window tint. 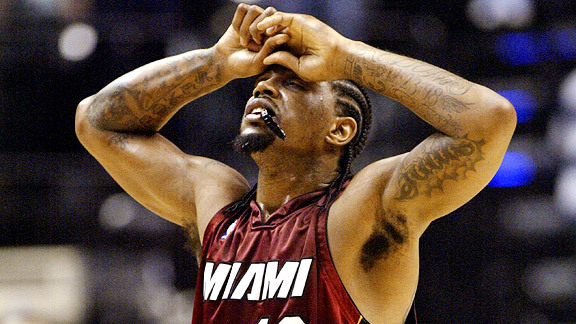 Haslem, of Southwest Ranches, Fla., has never before been linked to marijuana or other substance issues during his seven seasons with the Miami Heat. Passenger Fleming, who was charged with misdemeanor possession of marijuana, is not associated with the Heat. Haslem then admitted there was a gun in the glove box, according to the report, saying he was “not aware” of drugs in the vehicle. Haslem signed a consent form for the search. After the initial search, while awaiting the arrival of K9 drug dogs, Haslem tried to retract his consent to search, according to the report. Haslem’s felony count of marijuana possession could theoretically get him five years in prison, a $5,000 fine and two years of driver’s license suspension. A misdemeanor marijuana charge carries a $1,000 fine and 12-month license suspension in Florida. Schwartzreich said he could not see the case rising to the level of a vehicle forfeiture. 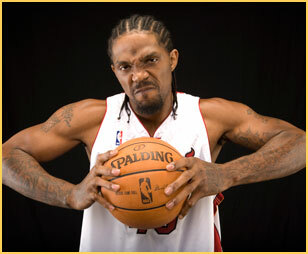 Haslem was taken to the Miami-Dade County Jail and released later on Sunday. “He is our anchor, he is a true warrior and a great professional,” Heat president Pat Rileyt said of Haslem in July, after Haslem said he would refuse higher-paying offers from elsewhere to stay in Miami. Haslem signed a new, five-year contract with the Heat last month, shortly before mourning the death of his mother due to cancer. During his NBA career, Haslem has averaged 10 points and 8.1 rebounds for Miami, helping the Heat win the 2006 NBA championship. According to the NBA’s “Marijuana Program,” a player who commits an initial violation must enter the league’s counseling program. A second pot violation gets a $25,000 fine and possibly inpatient or aftercare “treatment.” Any violation after that triggers a five-game suspension. The following raw footage is from NECN.com.